If Hollywood has taught us anything, it’s that the ubiquitous watering holes that littered the dusty trails traversed by thirsty cowboys roundin’ up those dogies in the Old West all came equipped with “batwing” doors (technically called “café doors”) hanging in the entryway. But how in the world could a barkeep protect his livelihood after hours with such a tiny barrier between his stash of firewater and the outside world? Café doors were actually practical for many reasons. They allowed ventilation in a small enclosure that was filled with folks smoking cigars and home-rolled cigarettes. The bidirectional hinges were handy for cowboys who both entered and exited carrying heavy saddlebags (unlike automobiles, horses don’t come equipped with locking storage containers in the rear, and there was always the danger of some low-down sidewinder stealing from you while you were inside getting your drink on). And those abbreviated doors shielded the church-going “proper” passersby from having to view the liquor, gambling, and spitting (spittoons were as common then as ashtrays would be later) going on inside. As Ronald M. James writes in his book Virginia City: Secrets of a Western Past, most saloons actually didn’t have these doors. Outside of certain parts of the country, it gets too cold in winter and too windy in summer for them to be viable. 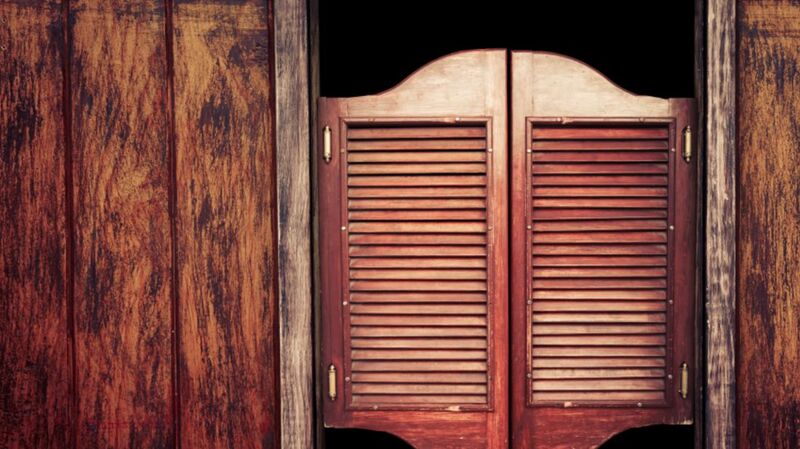 But for the saloons that had them, the café doors were actually a secondary barrier; the buildings were traditionally equipped with a standard set of solid doors on the outermost part of the entrance. When opened they laid flat against each side of the building during business hours, but they could be shut (and padlocked when necessary) during bouts of inclement weather, or when the building was unattended. While many mines in places like Virginia City, Nevada stayed open 24 hours, newspapers from the time allude to the fact that the saloons did in fact close in the early morning hours, making the locks necessary. As for Hollywood's depiction of saloon doors, set designers for Westerns made the batwing doors smaller than would be typically used in real life—likely in order to make heroes like John Wayne or Gary Cooper look larger and that much more imposing when they burst into the room searching for the yellow-bellied swamp rat who shot their Pa.